George Beauclerk, 3rd Duke of St. Albans, was the only son of Charles Beauclerk, 2nd Duke of St. Albans and his wife Lucy Werden. He was the great-grandson of Charles II and Eleanor (Nell) Gwynn, via their illegitimate son Charles Beauclerk, 1st Duke of St. Albans (1670–1726). George married Jane Roberts, daughter of Sir Walter Roberts, 6th Bt. on 23rd December 1752 at a ceremony performed by his uncle, James Beauclerk (1709–1787), bishop of Hereford. Jane was a great beauty and was painted by Nathaniel Hone, a fellow miniaturist and enameller, in 1768. The couple married at St George's, Hanover Square in London. In addition to her beauty she brought her husband a much-needed dowry of £125,000. George led an interesting if not morally conventional life. The biography commissioned by the St. Albans family described his life as, ‘a glittering crescendo of feats of incompetence quite unparalleled in the lives of any other dukes in the eighteenth century’, while the ever-acerbic Walpole named him ‘the simple Duke of St Albans’. In many ways, the Duke’s life mirrored the sensuous pursuits of his great-grandfather, including the fathering of many illegitimate children cruelly coupled with the lack of a legitimate heir Burke’s Complete Peerage delicately categorises him as ‘s.p. legit’, as he had no children born in wedlock but many born outside of it. Walpole notes that he fathered a child with his kitchen-maid and then gave the infant an extravagant funeral despite his debts. He was forced to live all over Europe to escape his creditors, living in Paris and Venice and finally dying in Brussels in 1786. He was buried 11 March 1786 in the Duke of Ormond's vault in Henry VII's chapel, Westminster Abbey. Dating to 1753, this portrait was most likely commissioned as a gift to his new wife, Jane, whom he had married in the previous year. His portrait shows a wealthy, aristocratic young man, his fine clothes presumably purchased with the help of his wife’s dowry. Gervase Spencer was well acquainted with the St. Albans’ family past, having painted a watercolour portrait miniature of St. Albans’ great-grandmother, ‘Nell’ Gwynn (Private Collection) , and producing at least two etchings of her, including one also dated 1753. 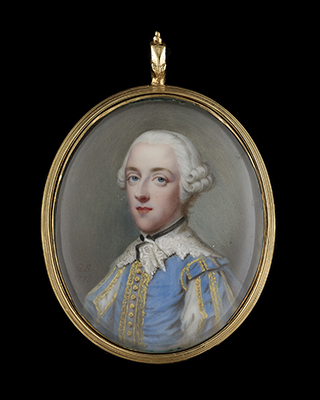 Given Spencer’s direct connection with the St. Albans family,is plausible that the watercolour miniature of his great-grandmother was also commissioned by this Duke or by his father.